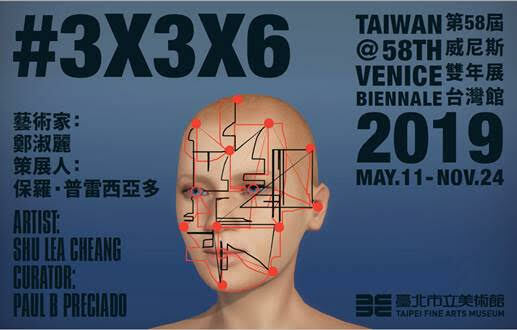 Taipei Fine Arts Museum, along with artist Shu Lea Cheang and curator Paul B. Preciado, have the pleasure to announce today 3x3x6, the new project representing Taiwan at the 58th Venice Biennale in 2019. Expanding on the artist’s practice over the last three decades, Cheang presents a new multimedia research project, including images, installations, and computer programming, in which past and present, virtual and real worlds converge. Born in 1954, Cheang grew up in Taiwan and developed an artistic practice in the US and Europe, putting into dialogue Western and Eastern contemporary approaches to the body, desire, affect, and technology. Internationally recognized as an Internet art pioneer, Cheang explores the changing relationship between technology and living bodies in the age of late capitalism and globalization, and its impact on body politics. Cheang combines the critical and visual traditions coming from feminist and queer cultures with cutting-edge digital/electronic technologies and computer programs to create performative artworks online and offline. Her films, installations, interactive interfaces, and live performances are a meditation on the power of images and fictions to undo normative representations of gender, sexuality, and race. The Palazzo delle Prigioni, a prison across from the Palazzo Ducale, will house the exhibition in Venice. Taking this location as an opportunity for a site-specific work, Cheang will create an immersive installation with multiple interfaces to reflect on different technologies of confinement and control, from physical incarceration to omnipresent surveillance systems in contemporary society. Using as inspiration ten historical and contemporary cases of imprisonment due to gender, sexual, and racial nonconformity, 3x3x6 questions how legal and visual regimes shape sexual and gender norms over time. The title, 3x3x6, refers to the new architectural model of industrial prisons developed globally: a 9-square-meter cell constantly monitored by 6 cameras. Combining physical space with a surveillance program, the project speaks about the new conditions of freedom and control within contemporary democratic societies. The installation is an invitation to imagine a society without prisons, but further a society beyond the epistemological prison of gender, sexual, and race categories. Taking as starting point the panopticon interface she created in Brandon (1998–99)—the first Internet art commissioned and collected by the Solomon R. Guggenheim Museum in New York—Cheang transforms the exhibition space at the Palazzo delle Prigioni into a high-tech surveillance territory infused with fictional and real data collected from history as well as live interactions. Computer algorithms mix three image sources for the installation projection, including the images of individual viewers on-site (with their consent) and their selfies taken with a smartphone application. A computer program will hack these real images and reprogram them into transgender and cross-racial digital images that resist surveillance networks. Cheang is conducting in-depth studies on prototypes across history to form ten characters, including Giacomo Casanova, Michel Foucault, and Marquis de Sade, towards developing ten fictional transpunk videos in sci-fi and abstract image format. Involving legal documents, fake news, historical reports, myths and fantasies, the work leads visitors into a maze of multiple narratives, where the distance between the one who represents and the one represented, the observer and the observed is radically quested. “Cheang forces visitors to interrogate the distance between punishment and pleasure, surveillance and lust, between the system that is apparently watching us and we as actively participating and enjoying the act of surveillance. 3x3x6 explores the relationship between political punishment and sexual enjoyment, between modes of seeing and processes of subject production. Inverting the watchful eyes of our panoptic society to partake in an empowering collective vision, the exhibition aims to reinvent desire and pleasure beyond hegemonic norms,” says curator Preciado.